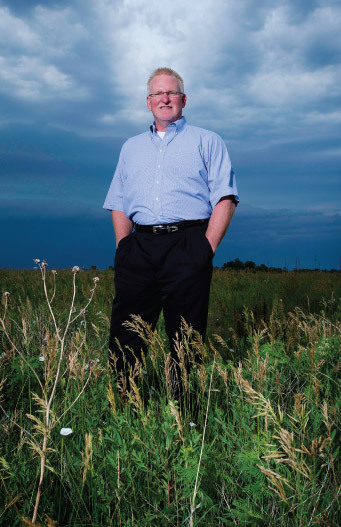 Inspiring and motivating those around him has been a lifelong passion for Dean Watson, POET Ethanol Products’ Vice President of CO2 and Denaturant. While many leaders cite the old cliché that “there is no ‘I’ in team,” Dean Watson truly walks the walk. Watson has worked in top-level jobs in different segments of the energy industry for almost three decades, spending the last five years at POET Ethanol Products growing the company’s CO2 business and building the denaturant business from the ground up. What matters most to Watson, though, aren’t his personal achievements but his team’s accomplishments – and preparing the next generation of workers for success. Coaching and mentoring is in Watson’s blood. Watson’s mother was a teacher and his father worked at Kansas State University. He grew up with two older brothers and a younger sister in an atmosphere of hard work and high expectations. “Failure just wasn’t an option,” says the Manhattan, Kansas native. In junior high, Watson got his first taste of leadership as captain of his wrestling and football teams. In high school, Watson went on to captain his track, wrestling, and football teams, and he made All-State in all three sports. As an accounting and business finance student at Kansas State University, he was elected president of his fraternity. Watson’s passion for leadership served him well after college when he went to work for Wichita, Kansas-based Koch Industries. Bob Casper, who is now President of POET Ethanol Products, also worked at Koch at the time and remembers the young Watson as a tireless go-getter. “He was a very strategic thinker who had a lot of energy and a lot of motivation to create and produce,” Casper says. From early on, Watson was an effective leader because of his high level of “conviction and confidence,” Casper notes. During Watson’s 18 years at Koch, he worked in many different roles—from scheduling and distribution to supply to commercial development—in business segments including solid fuels, fertilizers, agricultural products and more. “I’ve done a lot, from the back end of the shovel to the board room,” Watson says. Watson had worked his way up to a position as a vice president at Koch when he left the company to work in the entrepreneurial environment of a start-up polymer business and then moved on to a retail propane business. Watson joined POET Ethanol Products in 2006 after he decided to relocate his family from Kansas City back to Wichita. He called his old friend Bob Casper – who had started POET Ethanol Products about six years earlier – to inquire about job opportunities, and was soon offered a position heading up the already established liquid CO2 business. Since Watson took the reins five years ago, the company’s CO2 sales have increased significantly. The fact that the CO2 and denaturant businesses are thriving under Watson’s tutelage is no surprise to Andrea Craig, Denaturant Marketer for POET Ethanol Products. Shortly after Watson came on board at POET Ethanol Products, Craig and Watson drove 1,600 miles in four days together, meeting the general managers at a dozen ethanol plants around the Midwest. While Craig had met these folks previously, Watson “needed to learn who they were and what they were about,” Craig said.